Gustav Mahler (7 July 1860 – 18 May 1911) was a late-Romantic Austrian composer and one of the leading conductors of his generation. As a composer, he acted as a bridge between the 19th century Austro-German tradition and the modernism of the early 20th century. While in his lifetime his status as a conductor was established beyond question, his own music gained wide popularity only after periods of relative neglect which included a ban on its performance in much of Europe during the Nazi era. 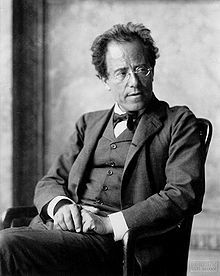 After 1945 the music was discovered and championed by a new generation of listeners; Mahler then became one of the most frequently performed and recorded of all composers, a position he has sustained into the 21st century. Born in humble circumstances, Mahler showed his musical gifts at an early age. After graduating from the Vienna Conservatory in 1878, he held a succession of conducting posts of rising importance in the opera houses of Europe, culminating in his appointment in 1897 as director of the Vienna Court Opera (Hofoper). During his ten years in Vienna, Mahler—who had converted to Catholicism from Judaism to secure the post—experienced regular opposition and hostility from the anti-Semitic press. Nevertheless, his innovative productions and insistence on the highest performance standards ensured his reputation as one of the greatest of opera conductors, particularly as an interpreter of the stage works of Wagner and Mozart. Late in his life he was briefly director of New York's Metropolitan Opera and the New York Philharmonic. Mahler's œuvre is relatively small—for much of his life composing was a part-time activity, secondary to conducting—and is confined to the genres of symphony and song, except for one piano quartet. Most of his ten symphonies are very large-scale works, several of which employ soloists and choirs in addition to augmented orchestral forces. These works were often controversial when first performed, and were slow to receive critical and popular approval; an exception was the triumphant premiere of his Eighth Symphony in 1910. Mahler's immediate musical successors were the composers of the Second Viennese School, notably Arnold Schoenberg, Alban Berg and Anton Webern. Shostakovich and Benjamin Britten are among later 20th-century composers who admired and were influenced by Mahler. The International Gustav Mahler Institute was established in 1955, to honour the composer's life and work. Click here to view all items related to Gustav Mahler.